We are having a small Thanksgiving this year, so I wanted to make some favor boxes for everyone. Sounds simple enough, but with a little help from Silhouette, I think they turned out extraordinary! They also took less than 20 minutes to make, which really helps when there's so much to do around the holidays. First, I opened Silhouette Studio and arranged two Pillow Box templates on an 8.5x11 inch paper (box measures 3.5" wide when folded) and cut the boxes out of white cardstock on the Cameo. Fold along the perforated lines and glue the edge with a glue stick. Next, I typed up "Gobble Gobble" and arranged it to cut in one piece by playing with the line and character spacing. I cut the Gobble design on the Cameo out of Gold Premium Adhesive Vinyl. Attach the Gobble to the pillow box on the left half of the box. Then, wrap some gold glitter tape all the way around the right half of the box. Add some candy or other favors to the box and close the edges (they shouldn't need tape, but you can add some if you want). Place on your Thanksgiving table and enjoy! 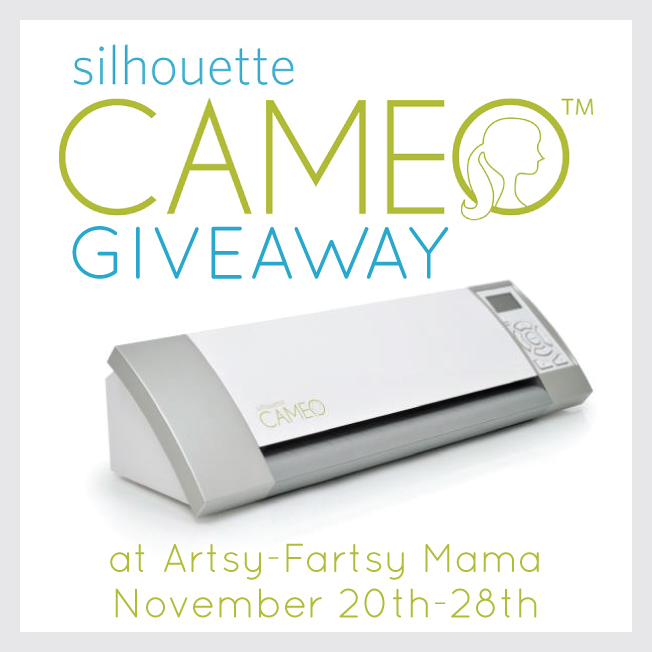 If you're feeling lucky, you can enter to WIN a SILHOUETTE CAMEO! Follow the directions in the Rafflecopter box below to enter. This giveaway is open from November 20th-28th, and open to anyone with a shipping address within the United States. Giveaway winner will be contacted via email and will be announced here on the blog. Be sure to stop by next Thursday (yes, Thanksgiving) to see if you're the lucky winner of this Silhouette Cameo, plus see all the details of the HUGE Silhouette Black Friday promotion! If you have been wanting to make that big Silhouette purchase, this would be the time to do it. So mark your calendars, alarms, and phone reminders for next Thursday so you don't miss out on some FANTASTIC deals!! I received the vinyl that is used in this post from Silhouette America. All opinions are my own. The first thing I would make would be a cover for the calendar I am making my mom for Christmas. LOVE your boxes! Great job!!! The first thing I would make would most likely be something for my grandson's birthday party. I would make some vinyl decals for my laundry room and dining room. I would probably make something to go with all my daughters teacher gifts for Christmas. I would love to win this as a gift for my Mom for Christmas so she'll stop borrowing mine. She would probably make confetti for New Years! The first thing I would make is invitations for my nephews birthday! Thank you for the chance to win! Would LOVE to win the Silhouette! I would make subway art with one of my favorite quotes. Have been dieting to get a Silhouette! With 5 kiddos there are always so many project with school and, gifts, cards, parties and crafting going on. I can only dream of the possibilities. I've working on my teen boys' room makeovers so you can bet I'd be labeling everything in sight!! Very cute boxes!! Thank you so much for sharing them with us!! And thank you very much for the chance to win, it would be a fabulous early Christmas present!! I would LOVE to win! The 1st things I would use it for would be decor for my classroom....so many many ideas just waiting to be done! I would LOVE to win! I would use it in my classroom first...so many many ideas just waiting to happen!! My 5 year old passed away last year from congenital heart disease. I've trying to figure out what to do with his clothes. I found a neat appliqued design with hearts that I want to make. The first thing I would make would probably be Christmas cards and gifts. I would make some personalized Christmas ornaments. I would get started on Holiday decorations and gift boxes for Christmas. I am seeing so many Silhouette tutorials on the internet right now and I am very jealous that I can't make them! Fingers & toes crossed! I would make a thank you card for my aunt for letting me try to sell my crafts at her craft fair. I would make a Christmas ornament in Memory of my dad! I don't know what I would make first...I have so many ideas of things to make....vinyl home decor might be first! I would love to make Christmas cards! -Mandy T.
I would make a photo at for my baby girls first Christmas! There are so many adorable projects that the Cameo makes possible! Love this project && would love to win one! I would live to make a family name sign! Oh I love Silhouette giveaways! My list of things to make is about a mile long - first I would make a great sign with a lot of words, because I don't do any projects where I have to cut out letters - there's no way you can do good ones without a Silhouette! I LOVE those favor boxes, I think I'll try something like this for my son's class, but it would be awesome (and so much easier!) with a Silhouette. I have been wanting one of these forever! I would love to get started on fun stuff for my daughters 2nd bday! I'd like to make some teacher Christmas gifts if I won a Silhouette! Thanks for the opportunity! I'd like to make some teacher Christmas gifts if I won a Silhouette. Thanks for the opportunity! I have so many idea waiting in the que bc I've wantingca Silhouette for a long while now. I have so many ideas in the que because I've been dreaming of a Silhouette for a long while now. First thing I would make would be to cut a vinyl quote for my wall. I would make some vinyl decals for signs. Just this past weekend, I went through a demonstration of the Cameo. VERY COOL! I really want one now! I'd love to win this! By the way, the pillow boxes are adorable and such a great idea! This would be a great addition to the kids table. Christmas gifts would be so much better with this! OOOOH!!!! I want one sooo bad!!!! PLEASE PICK ME!!!!!! The first thing I would make would be decorations for my kids' joint bday party which will be in January. Thanks for the chance! The first thing that I would make would be decorations for my kids' joint bday party which will be in January. Thanks for the chance. the first thing i would make would be a thank you note... and then this years Christmas card. I would try to cut vinyl to decorate tumblers for the soccer team! I would make a banner for my new craft room! I would make a new banner for my craft room! i would make vinyl decals for my home binder and my recipe binders. I have been wanting a Silhouette and would love to win!!!! I would make canvases with quotes on them and also make some ornaments! Wow! This would be amazing to win! I would love to make decorative pillows! The first thing I would make is a "Put Your $ Where Your Mouth Is, Brew Local" sign for my husband's beer brewing station! The first thing I would make is a "Put your money where your mouth is, Brew local!" sign for my husband's beer brewing station. The first thing I would make is a "Home is where the Navy Sends us" board. I have wanted one for so long but haven't been able to afford it as we have to many stations to list. I would make Superman and Batman stuff for my soon to be 3 twin nephews birthday!!! Thanks for this great chance to win!! I would make Superman and Batman stuff for my soon to be 3 twin nephews!! Thanks for the chance to win!!! The first thing I would make is a a quote wall hanging or a tshirt design. The first thing I would make would be an Advent Calendar!!!! Would love to win one! First thing up would be some cute holiday tags! I would make cards first! I would try a little bit of everything! Looks like fun. I would make christmas cards first thing. The first thing I would make is gift boxes to give away holiday candy in! I want to label EVERYTHING!! The first thing I would make is some canvas word art or labels for jars. Actually those gift boxes would probably be the first thing I'd make with it, especially given this time of year. Great project idea. The first thing I would make with the Silhouette would be an advent calendar. Thanks so much for the chance to win one. This has been on my wishlist forever! Your picture actually just gave me a fabulous idea! I'm handmaking some Christmas gifts this year and was trying to think of a nice way to package them before I mail them out. Those gift boxes would be perfect, with a Christmas theme, of course! Your project actually gave me an idea! I'm making some Christmas gifts by hand this year, and I was trying to think of a nice way to package them before I mail them off. Those pillow boxes would be perfect, except in a Christmas theme, of course! More Christmas presents. I am trying to make all of them this year! I want to make some Christmas cards. I would make Christmas decorations. Wedding stuff. Lots and lots of wedding stuff. My daughter is getting married next year. gift tags and a new years backdrop!! Love the boxes you made...so I might go with something like that. I would make a gift for Karen Klepsteen because she told me about this give away. 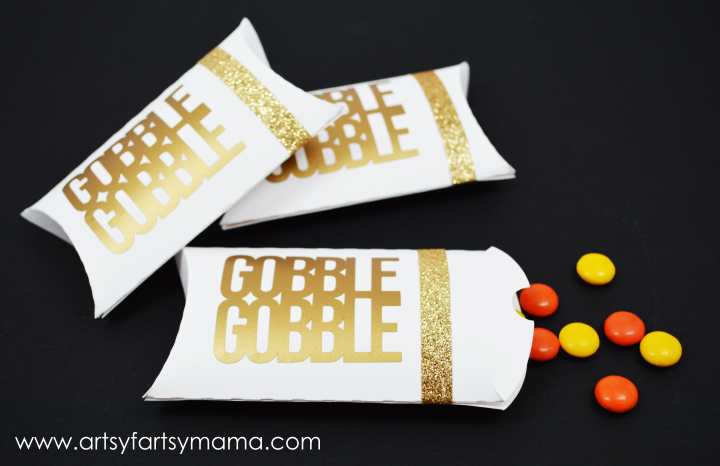 Gobble Gobble boxes. They are such a cute idea. My grandkids would love them. I would make gifts for my family, Christmas cards and do some scrapboking. I would love to make subway art for my family room. I'd make a scene! LOL! I'd be dancing and yelling if I won. I love my Portrait but wouldn't mind adding a Cameo to the collection! Thanks for the giveaway! The first thing I would make is gift boxes for holiday goodies. Thanks for sharing this post and giveaway! I would first make custom stencils! A Christmas banner for my fireplace. I've been wanting to do some word art on canvas & I think the silhouette would be such a great help! Thanks for the opportunity to win and help my future daughter-in-law make out-of-town guest bags for her April wedding. gift tags for Christmas presents. Trying to win for my sister-in-law. Every girl needs her own Silhouette! I'd make something for my son. I would love to upgrade from the Portrait to the Cameo so I can make things bigger! I already have Glitter and chipboard on the way, and a small stock of Vinyl, so I think I would have to add to that and get some HTV and try making customized t-shirts for my grands! I'd make Wall Words. Thanks for the chance!! I love your treat boxes! I would totally make those! I love the treat boxes you made! I would totally make those!! I would loveeee to win! I have so many project I could do if I had the Silhouette!!!! If I had one I'd start off with Christmas decorations. Something Christmasy! :-) Today is my birthday. This would be an awesome present. WOW, please let me get lucky. I have been wanting this super cool machine for quite a while. Thanks for this awesome chance. The Batman logo to go on a cape I am making for my son. I would do a quote in my family room with vinyl! glorious vinyl!!! I'd definitely make some ornaments and holiday gift tags! I would make a holiday table runner! Thanks for the giveaway! I would make gift tags for presents. I would use it to make gift tags. I would start right away working on my grandsons scrapbook! He has a little brother coming in February so I need to get busy! Something with vinyl I think. I really like that stuff! I would start working on my grandsons scrapbook! He has a little brother coming in February so I need to get busy! I want to make some fun Christmas ornaments!! The first thing I would make are those adorable treat boxes! I would love to make a "oh holy night" sign! The first thing I would make is a scrapbook layout. I purchased some card stock that is too wide for my Portrait but perfect for a Cameo. I also shared the link to your giveaway on my FB page! I don't know what I'd make first, but I'd sure like to find out. Thanks to you & Silhouette for the chance. I would cut vinyl for glass picture frames; no pictures, just vinyl cuts on the glass. I would cut out something for a Christmas craft! I would love a new cutter so I can make my cards again. I would love to make stencils, stickers, banners and so much more!! I would love to own a Silhouette - the possibilities are endless! The first thing I'd make would be a banner for my daughter's room. I would make vinyl decals for my son. I would love to try and make some DIY wall decals for my daughter and sons room! I'd first make label for some coffee containers that I've turned into canisters for office and craft supplies. I'd have a lot of fun with this! I would really love to have one of these! It would really help me organize as well as cut down on the massive amounts of time I take trying to cut things out. There are so many things to make...I can't even begin to list them. Great giveaway! Pick me! Pick me! My first project would be a project I saw on Pinterest. Stemless wine glasses with the saying “Let’s Get Lit” on them in vinyl, cut using the Silhouette Cameo and then a few extra Christmas bulbs in vinyl to add some flare. I would use this as my Greed gift in my family’s annual Greed game on Christmas Eve. I would also pair the glasses with a bottle of local Michigan wine. Oh my goodness… where do I begin?? I have wanted to buy burlap pillow covers and decorate them for each holiday. Like the winter one would say "Let it Snow" with snowflakes and Valentines would say LOVE in pink and red. I also want to glass etch all my glass dishes with our last name. And add christmas vinyl to our home. If only this was in the budget this year to get one of these. I've love to win it though! Thanks for the amazing giveaway! You would have to ask my husband. He is a man crafter and would steal it away from me ;). My first item would be to make hundreds of decals to share for our cars. After all of those I would be off to the races making signs, I think. And lots and lots of labels. I'd make a Christmas sign! Holiday cards and vinyl decals! I'd start with Christmas subway art and then my son's birthday party invitations. I'd start with Christmas subway art and then my son birthday party invitations in January. Thanks for this giveaway! I have several vinyl projects pinned--my sister wants a dry erase menu board for her kitchen. I'd knock out her Christmas gift! There would be so much I would make from this but probably Christmas cards. I'd love to upgrade from the SD & make bigger wall decals! I would use the machine to make wall quotations. If I won a Cameo, the first thing that I would make would be a glass block! Thank you for the chance to win! I want to host a New Years party and I could make the coolest invites and decorations with this!!! would love to win this. My sister and I get together and scrapbook, I would share it with her, and let her use it too. I have wanted a cameo for so long! 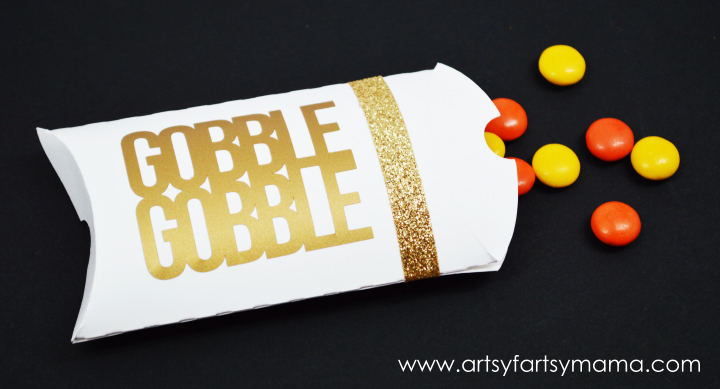 I would start with the gobble gobble pillow boxes and then create some Christmas decorations. I would make some adorable gift toppers!!! There are so many ideas on pinterest that I just can't do without one these babies. I would all over pinterest making everything I could find! Since it's almost Christmas maybe cute little gift tags for presents!? Those would be fun to make and fun to add to presents! I would etch some wine glasses! I want to etch my pyrex dishes with our name on them! I would make some wall art!